The first flag was that of movement Katipunan, created by Benita Rodriguez with the aid of the wife of Bonifacio, Gregoria de Jesus. The flag was a red rectangle red with three "K" white in a horizontal alignment. Some members of the movement used a variant of the flag in which one of the three "K"s was put above the other two forming a triangle. A third variant had a single K on it. (These flags could be construed as being related to the Klu Klux Klan, but they have nothing to do with it). What is the significance of the K's? You will recall that the Spanish colonised the Philippines for well over 400 years. Towards the close of the XIX century, nationalist groups were being formed to drive out the Spaniards. Andres Bonifacio (1863 - 1896) popularly regarded as the Father of the Philippine Revolution founded the Katipunan which was the main nationalist group which fought against the Spanish in the quest for independence. That is what the K stands for. The Katipunan, which literally translates to Society or Association, began on July 7, 1892. Jaume shows their war standard as the red flag with three white K's in a horizontal alignment. The K's stood for "Kataastaasan Kagalanggalangan Na Katipunan ng Mga Anak Ng Bayan". Loosely translated to mean the "Highest and Most Respectable Society of the Sons of the People." Black flag with one white K and the skull and crossbones (in white) side by side. Flag used by General Llanera & his troops who fought in the provinces of Bulacan, Tarlac, Pampanga, & Nueva Ecija. The flag was known as "Bungo ni Llanera," or "Llanera's Skull." Red flag with a white triangle on the hoist with K K K in three corners and a sun behind an outline hill. An 1895 version attributed to General Pio Del Pilar has a slight resemblance to the present flag. Rather than a red and blue stripe the field except for the triangle of white is red. The gold stars and sun being replaced by the red K's and a red sun rising behind a mountain. The sun has 8 rays. Coincidence or a misdated reference? Red flag with a white sun (much like the Vergina Sun of Macedonia!) and KKK in white underneath. An 1894 Katipunan flag has the three K's but also a sun with 16 rays. I cannot find any information as to why 16 rays were used. Flag belonging to Andres Bonifacio, the Father of the Katipunan. The Katipunan was discovered by the Spanish on August 19, 1896. On 23 August 1896, Bonifacio's banner was unfurled during the Cry of Pugadlawin in Kalookan where Filipinos tore up their cedulas (residence cards) defying Spanish authority. The flag was blooded a week later, 30 August 1896, during the Battle of San Juan del Monte, the first major battle of the Philippine Revolution. Flag adopted by the Magdalo faction in Cavite in 1896. General Aguinaldo's flag bearing the letter "K" from the pre-Hispanic Philippine alphabet. The eight rays represent the first 8 provinces that rose up in revolt against Spain: Manila, Bulacan, Pampanga, Nueva Ecija, Tarlac, Laguna, Batangas, & Cavite. The letter is a "ᜃ", the Tagalog script letter ka. Modification (shortly after) of the flag of the Magdalo faction. New flag adopted by the Katipunan on 17 March 1897. The flag of the association "Katipunan" (Sovereign and Venerable Association of the Children of People). This group was founded in Manila (July 7 1892) and it fought against the Spanish troops for independence of the Philippines. According to information from Luis Sorando the letter located in the center is a Gothic "A", of unknown significance. He also clarified that the original is conserved as a trophy in the museum of the Army, and the white color has changed to a yellow due to the dirt. Information: Spanish magazine of Defense and Luis Sorando Muzás. It was a banner probably used in a Katipunan Lodge or Cell (the Katipunan was patterned after Spanish Masonry in its rituals and practices). Thus, it was used in secret on the wall, probably during initiations, but not in the field (in the same museum is a Katipunan war flag captured by the Marques de Melin, according to information sent me by Don Santiago). In the Philippines there are some KKK (Katipunan) flags: The Andres Bonifacio's flag, at present in the "Museo ng Katipunan", Barangay Bulaklakan, Lipa City, Batangas Province and the General Mariano Llanera's flag, at present property of the heirs. The Bonifacio's banner or better the Bonifacio's flag had 12 rays, not 16 or more, the rays were more short than in all the images we have (like the rays of the Taiwanese flag ). That flag is in the Museo ng Katipunan, Barangay Bulaklakan, Lipa City, Batangas Province, we don't have pictures of it because is forbidden to take a picture. This reconstruction is based on a photo in a magazine (unspecified source). The central Tagal letter is the K. Red seems to be the background colour. There are several red flags but not single blue flags. The sun can be white or yellow; the most frequent is white, but in preserved flags, the white parts are now yellow (due to time). My educated guess is that it is white but Manuel Quezon can give us more light. From the photograph I would think this is the reverse of the flag. There appear to be some devices on the right of the cloth, as if it were to be attached to the mast on that side. Your deduction seems correct, except the styled "K" that looks like an "I" would more or less look the same from either side; what it proves though is that it is a flag and not a banner like what is used in the Catholic Church. I only wonder if yellow is correct. The livery traditions of the Katipunan were white and red, I think the logical assumption is a white sun on a red field. This does, however, add further proof to the early origins of the sun-symbol. The sun of course is prevalent in Philippine symbolism and mythology, but can also be traced to the many coins from former Spanish colonies that were in wide circulation in the Philippines prior to the Philippine revolution: the Spanish government had to have the coins stamped to deface the revolutionary symbols, including many mythical suns, Phrygian caps, etc. We never had the tradition of using the liberty pole or the Phrygian cap but it seems that revolutionaries in the Philippines liked the mythical sun. This flag was also used by the mutineers in July 2003. It represents the use of some very significant symbols in Philippines national iconography. The sun harks back to the mythical sun used in the flags of the Katipunan (the secret organization that began the Philippine revolution in Spain in 1986). The letter "I" in the middle is in "alibata" or ancient Tagalog script, and represents the letter "K," symbolizing "Kalayaan" or "freedom." The sun and letter K are all over the flags of the Katipunan and its various leaders and provincial cells. 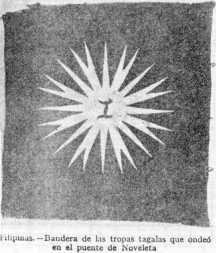 The sun used in the mutineers' flag, though, had more than the usual 8 rays which is standard in our national iconography, representing the 8 provinces placed under Martial Law by the Spanish government when the revolution began. Why there are more rays has not been explained, there were 70 mutineer officers but there aren't that many rays; it could stand for the 13-15 regions of the Philippines at present. The choice of name of "magdalo" has also sparked some curiosity. The province of Cavite had two factions of the Katipunan in 1897, the Magdiwang, which retained allegiance to Andres Bonifacio, head or Supremo of the Katipunan, who came from Manila, and the Magdalo, named after Mary Magdalene, patroness of Kawit, Cavite, from which came its leader, Emilio Aguinaldo. When an election was held to transform the secret revolutionary movement to a formal government, Aguinaldo won over Bonifacio in the voting. The result was a division which led to Bonifacio's arrest and execution. The symbolism of "magdalo" then lies precisely in a coup. The flag of General Gregorio del Pilar, the "Boy General." Flown during the Battle of Tirad Pass, Ilocos Sur. General del Pilar's forces allowed General Aguinaldo's retreating army to escape. The "Boy General" died at age 24 defending the pass on 2 December 1899. The Philippine Republic issued a set of of postage stamps several years ago showing the flags mentioned, and some others (numbers 849-857).